Welcome to the Archbishop Thomas J. Murphy Archive. Archbishop Murphy was a prolific writer throughout his life as a priest and bishop. The written word was one of his passions. He possessed a unique ability to share thoughts and perspectives on the core teachings and doctrine of the Catholic Church that spoke to ordained ministers, religious women and men and the laity in a meaningful and relatable way. Each of the 1,176 documents falls into one of 39 different subject categories. Archbishop Murphy wrote extensively on a number of topics including: Catholic schools and religious education, the celebration of the Eucharist, the gift of life from conception to natural death, the parish community and stewardship. The Archbishop Thomas J. Murphy Archive is truly a unique online resource. It has no peer. People of all ages, religious backgrounds and walks of life can use it to learn more about the tenets of the Catholic Church as they continually strive to deepen their faith and build a relationship with God. We would like to extend our most sincere gratitude and appreciation to Diocese of Great Falls-Billings, MT and the Archives Department of the Archdiocese of Seattle. Each of these organizations made material contributions to the development of the archive. Their tireless efforts and dedication to this endeavor will forever be appreciated. One of the most meaningful aspects of the archive is that it contains 352 homilies written by Archbishop Murphy. I hope this Advent season is one filled with much meaning as we prepare to celebrate the birth of Jesus Christ. The University of St. Mary of the Lake in Mundelein, IL generously funded the development of the Archbishop Thomas J. Murphy Archive. 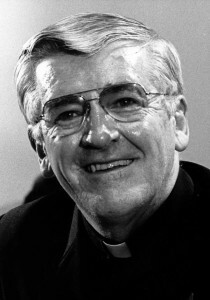 Archbishop Murphy was educated at the university and later served as its Rector from 1973 to 1978.